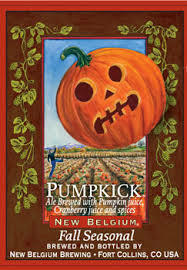 (Fort Collins, CO) – New Belgium Brewing Co. took the plunge earlier this summer, releasing its first seasonal pumpkin ale, though the company hasn’t officially announced it yet. What’s that bite of tartness doing in a pumpkin beer? Adding the unexpected kick of cranberry juice to brighten this traditionally spiced seasonal ale. PUMPKICK is brewed with plenty of pumpkin juice cinnamon, nutmeg, and allspice, but its the cranberries and touch of lemongrass that send your tastebuds sailing. ABV: 6.0%. According to Twitter reports, we can deduce the beer first hit the market just before the July 13th weekend but it may not have made its way around to all markets yet.